When it comes to literature, the mystery – or in slang terms – the whodunit – is a vastly popular art form. And every whodunit has to have its detective – whether policeman or layman, the detective is the one who pieces together the clues into a picture puzzle of clarity and thereby solves the mystery and tells us, in the end, well, who done it! There is no shortage of great literary detectives – both historical and present day - among them characters like Phillip Marlow, Sam Spade, Inspector Morse, John Rebus, Father Brown, Miss Marple, Hercule Poirot, V.I. Warshawski, Perry Mason, and another, whom I’ve only recently popularized in a new serialization on TV, the French detective Jules Maigrait. But there can be little doubt that the number one super sleuth of all, the one who is truly without equal, is Sherlock Holmes, a fictional character from the mind of Scotsman, Sir Arthur Conan Doyle. Born on May 22, 1859 in Edinburgh of Irish Catholic parents, before his emergence as an writer, Doyle studied medicine at the University of Edinburgh. It was there at university where Doyle met other writers and where one of his professors, Dr Joseph Bell, is said to have inspired his most famous character. Holmes first appeared in print in 1887 in "A Study in Scarlet." In total Doyle would carry Holmes into four novels and 56 short stories. Though he was not the first fictional detective he is arguably the best known. Guinness World Records list Holmes as the “most portrayed movie character in history” with more than 40 actors seen in the role on film – perhaps most notable among them, Basil Rathbone who played Holmes in a series of films beginning in the late 30's and on through the 40s. Adding portrayals in television series brings another 30 names to bear – like Peter Cushing, Peter Lawford, Jeremy Brett, Boris Karloff and of course, Benedict Cumberbatch, and if you want to take in radio, stage and one-of television programs the total number grows to well over 100 actors who’ve brought the character of Sherlock Holmes to life. Basil Rathbone is considered by many to be the quintessential Sherlock Holmes and it was he who adopted the Deerstalker cap and Inverness cape as an iconic part of Sherlock's wardrobe. Today the image of Holmes has been brought to life in a new manner, by a descendant of his creator, Sir Arthur Conan Doyle. 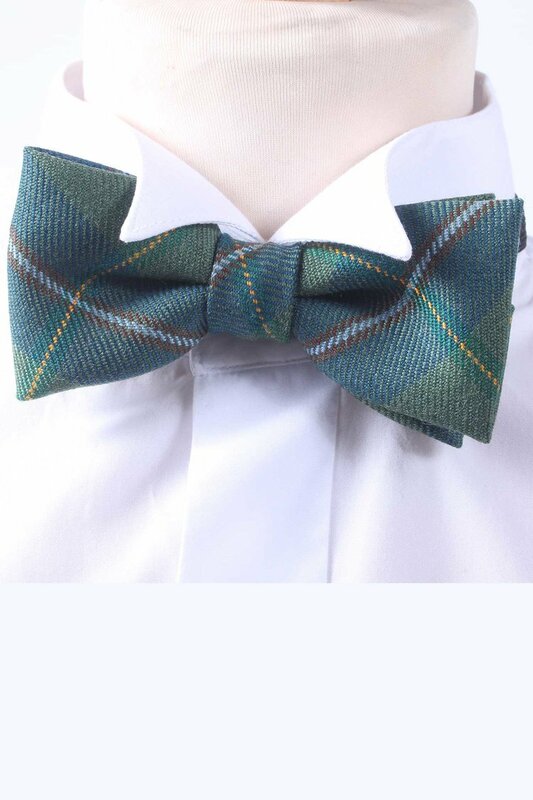 Tania Henzell, currently of Edinburgh, has recently released the Sherlock Holmes Tartan and an expanding line of gentlemen’s and ladies clothing and accessories. The design is a tribute to both Holmes and Doyle – the primary green and blue colors representing Doyle’s irish and Scottish roots, another blue and brown strikethrough symbolizing Riechenbach Falls, where Holmes famously encounters Professor Moriarity, and a single yellow strike through representing Holmes clarity of thought, his penchant for deductive reasoning. Sir Arthur's great-great step-grandaughter, Tania Henzell and her son modeling the new Sherlock Holmes Tartan she designed in association with the House of Edgar in Perth, Scotland. Numerous items of clothing in the new tartan have been made available to the public. Click on each photo to enlarge. Ms. Henzell says the timing seemed right for the creation of a Sherlock Holmes tartan because both the super sleuth and tartan are more popular today than ever before. The character of Holmes has been most recently popularized thanks to the films of Robert Downey Jr., and television offerings like the BBC's "Sherlock" starring Benedict Cumberbatch, the CBS-TV series "Elementary" while a new film, "Holmes and Watson," is to be released this year with Ralph Fiennes, Hugh Laurie, Will Farrell, and John C. Reilly. Henzell is hopeful one or more of the stars might wear a bit of the tartan at the red carpet premier and the Conan Doyle estate say they are actively involved in talks to make that happen. Additionally there are hopes the tartan might even make an appearance in the film and the now rumored Downey Jr. effort, "Sherlock Holmes 3."